Note: The contents of third-party articles presented on this page are provided for general knowledge of current events and do not necessarily represent the views or opinions of Expert Reconstruction Company LLC. 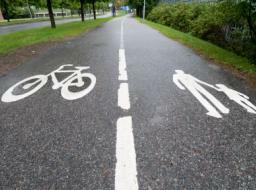 Biking in the U.S., especially in urban areas, is on the rise—and so are cyclist fatalities. killed in 2012, up 16 percent from 680 in 2011. Over the same period, other motor vehicle deaths grew 1 percent. Volvo wants to extend its sterling reputation for safety to cyclists, with a helmet that can alert both biker and driver if a Volvo veers precariously close to a bicycle. receives an alert through a head-up display, even if the cyclist is in a blind spot, behind a bend or another vehicle, or barely visible at night. existing things and ecosystems to make this happen,” Heiniger says. Dan Fried, a 47-year-old videographer who has type 1 diabetes , never made it to the diner to meet his brother. As he drove through New Jersey that night in November 2010, he said his blood sugar fell and he became disoriented. He pulled his van to the side of the road, where state troopers, who had received a call about an erratic driver, found him slumped behind the wheel, barely coherent. Believing Mr. Fried to be intoxicated and seemingly uncooperative, the troopers tried to frisk and handcuff him. In the scuffle, he broke his wrist. He was wearing a bracelet that identified him as a diabetic. "I was very upset at the whole thing," he said in an interview. Mr. Fried filed a lawsuit alleging civil rights violations. The state attorney general declined to comment on pending litigation. Sudden bouts of low blood sugar, or hypoglycemia, can lead to confusion, delayed reaction, visual disturbances or loss of consciousness. Even in the absence of low blood sugar, people with diabetes may have impaired vision or nerve function in the feet, which can affect driving. Partly as a result, drivers with diabetes are 12 percent to 19 percent more likely than other drivers to have a car accident, studies show. A study of 202 people with diabetes who were taking insulin found that about 60 percent of participants never tested their blood glucose levels before driving. Most participants said they would stop driving if they began to feel symptoms of hypoglycemia, but it can be difficult to recognize milder symptoms, such as blurry vision, sweating or feeling tired or irritable, said Dr. Daniel Lorber, director of endocrinology at New York Hospital Queens. "If it drops further, then you get into some severe thinking and judgment issues, and that's what we're concerned about," he said. "You could pass out or have a seizure." Awareness of the problem is surprisingly limited. A study in 2003 that surveyed people with diabetes in seven American and four European cities found that half of those with Type 1 and three-fourths of those with Type 2 diabetesreported that their doctors about the risks of hypoglycemia and driving. While most accidents related to diabetes complications happen to a small group of people with Type 1 diabetes, who need to take insulin, people with Type 2 diabetes are also at risk. An analysis of American insurance claims, published in November in the journal Diabetes, Obesity and Metabolism, focused on people with Type 2 diabetes who were taking a diabetes drug other than insulin. It found that drivers under age 65 who had been treated for hypoglycemia were 40 percent more likely to have motor vehicle accident than those who had not had hypoglycemic episodes. "Up until now, most people assumed that diabetes-related driving accidents were caused by insulin therapy," said Dr. Brian Freier at the University of Edinburgh and an author of the study. They didn't think "people on other therapies would cause an accident through hypoglycemia." Dr. Frier noted that a class of diabetes drugs called sulfonylureas, which stimulate the pancreas to release insulin, may be especially likely to trigger hypoglycemia, particularly longer-acting sulfonylureas like the drug glyburide. Shorter-acting drugs in this class, including glipizide and gliclazide, may be safer for drivers with diabetes, he said. Drivers at risk for hypoglycemia also "have a responsibility to make sure that their blood glucose level is not too low," said Dr. Ned Kennedy of the Cleveland Clinic. He advised drivers with low blood sugar to eat something sugary and to wait 15 minutes and check again. "Just taking the time to do that could save them a lot of trouble and prevent them from being a danger to themselves or to other people" on the road, he said. Daniel Cox, a professor of psychiatry at the University of Virginia Health System, and his colleagues have developed a program called Blood Glucose Awareness Training, which teaches people to recognize the physical signs of low blood sugar. Dr. Cox also is enrolling patients in Diabetes Driving, a study that aims to identify and prevent other risks associated with drivers who have diabetes. The vast majority of accidents have nothing to do with diabetes, however, and Dr. Cox and other experts are wary of stigmatizing people with the disease. "We don't want to isolate out diabetics as bad drivers," he said. A nationwide study shows that tougher licensing laws for teenage drivers have reduced deadly accidents among 16-year-olds, but with an unintended consequence: increasing the fatal crash rate among 18-year-olds. Over the last two decades, many states have put in place strict teenage driving laws, with graduated driver's license programs that require young drivers to meet certain restrictions before they obtain a full license. While the rules vary by state, they generally set a minimum age for earning a driver's permit or license and require a set number of supervised hours behind the wheel, and some prohibit driving with fellow teenagers, ban night driving or require at least six months of instruction before a driver's test. Over all, the tougher laws - which most states began adopting in the mid-1990s - have been credited with a 30 percent drop in highway fatalities among teenagers. But "most of the prior studies on graduated driver licensing have only looked at 16-year-olds," said Scott Masten, a researcher with California's Department of Motor Vehicles and the lead author of the current study. "When you do that you go, 'Wow, these programs are saving lives,'" he said. To get a broader perspective, Dr. Masten and his colleagues looked at data on fatal crashes involving 16- to 19-year-olds that occurred over a 21-year period, beginning in 1986. "When you look at the bigger picture across 18- and 19-year-olds, it looks like we're offsetting those saved crashes," he said. "In fact, 75 percent of the fatal crashes we thought we were saving actually just occurred two years later. It's shocking." The study, published Wednesday in The Journal of the American Medical Association, found that since the first graduated driver programs were instituted, there have been 1,348 fewer deadly crashes involving 16-year-old drivers. But at the same time, there have been 1,086 more fatal crashes that involved 18-year-olds. The net difference is still an improvement, Dr. Masten said, but not quite the effect that many had assumed. "The bottom line is there is still a net overall savings from introducing all these programs," he said. "So we are saving teen drivers over all, but it's not nearly what we thought it would be." Dr. Masten strongly suspects that the reason for the increase in deadly crashes among 18-year-olds is that many teenagers, rather than deal with the extra restrictions for 16- and 17-year-olds, are simply waiting to get a license until they turn 18, and skipping the restrictions altogether. As a result, a greater proportion of inexperienced drivers hit the road at 18. He pointed out that when California instituted its tougher driving laws for teenagers, the proportion of 16- and 17-year-olds getting licenses to drive dropped while the numbers at 18 and 19 did not. But the authors also suggested another hypothesis: that teenagers going through graduated driver license programs are not getting as much practical driving experience when they have "co-drivers." In other words, while having adult supervision in the car reduces risk, it also protects teenage drivers so much that they miss out on learning experiences that can be gleaned only by driving alone, like knowing what it means to be fully responsible for a vehicle and knowing how to "self-regulate." "Even though we want you to learn by driving with your parents, it's really different from the sorts of things you learn when you're driving on your own," Dr. Masten said. "The whole thing about learning to drive is you need to expose yourself to crash risk to get experience." In an editorial that accompanied the study, researchers with the Insurance Institute for Highway Safety, a nonprofit group financed by insurance companies, said the findings raised a "serious issue" that policy makers should take note of. They pointed out that one of the states with the toughest programs for teenage drivers is New Jersey, where all first-time drivers under 21 have to adhere to graduated driver restrictions. "New Jersey's approach has been associated with significant reductions in the crash rates for 17- and 18-year-olds and virtually eliminates crashes among 16-year-olds, without adversely affecting crash rates for 19-year-old drivers," the authors wrote. But in a twist, New Jersey's tough laws may have just shifted the effect to 21-year-olds, similar to the way tough restrictions on 16- and 17-year-olds were followed by a spike in deadly crashes among 18-year-olds in other states, Dr. Masten said. In New Jersey, a study of deadly crashes did not look specifically at 21-year-olds; they were mixed into a larger group of 20- to 24-year-olds. But the research still found a 10 percent increase in deadly crashes in that group after New Jersey's tougher graduated driver licensing program was instituted, suggesting that 18-, 19- and 20-year-olds may be waiting out the tough restrictions there as well. Other researchers have also found that the reason the rate of crashes among teenagers is so high - they account for 10 times as many crashes as middle-aged drivers - is not that they are reckless, but that they make simple mistakes , like failing to scan the road, misjudging driving conditions and becoming distracted. Some of these problems can be addressed through what experts call narrative driving: having adult drivers point out to teenage passengers examples of unsafe driving and explain to them how they are dealing with distractions on the road. Lack of sleep can also be a major factor in teenage crashes. A study in The Journal of Clinical Sleep Medicine this year found that teenagers who started school earlier in the morning had higher crash rates . US road safety: Deaths lowest in more than 60 years. How we got there. 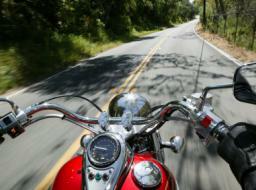 In 2011 the number of fatalities per vehicle miles traveled was the lowest ever, the Department of Transportation said. Technology and education are credited with the improved US road safety. Improved technologies and education made America’s roads safer in 2011 than they’d been in more than 60 years, especially for occupants of passenger vehicles, the US Department of Transportation (DOT) reported Monday, and the number of fatalities per vehicle miles traveled was at its lowest level ever. But DOT’s National Highway Traffic Safety Administration (NHTSA) cautioned that the good news was no reason for American drivers to lower their guard, saying fatalities were still on the rise in some categories, for example for cyclists of all stripes – pedal and motor – and as a result of distracted drivers. 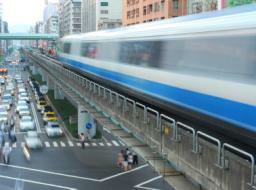 According to NHTSA, traffic fatalities fell to 32,367 in 2011, a 1.9 percent drop over 2010 and the lowest since 1949. Experts say the reasons for the decline are better seatbelt and airbag technologies, improved driver behaviors on the highways, and more safely designed cars. There has also been more emphasis in recent years on formal official programs to improve safety. “We’re confident that NHTSA’s 5-Star Safety Ratings Program and nationwide collaborations like ‘Click It or Ticket’ and ‘Drive Sober or Get Pulled Over’ have played a key role in making our roads safer,” said NHTSA Administrator David Strickland. But they are being careful not to overstate the case. There is still much improvement to be made. Here are their findings released Monday. • Fatalities declined by 4.6 percent for occupants of passenger cars and light trucks (including SUVs, minivans and pickups). • Deaths in crashes involving drunk drivers dropped 2.5 percent in 2011, taking 9,878 lives compared with 10,136 in 2010. • While Americans drove fewer miles in 2011 than in 2010, the nearly two percent drop in roadway deaths significantly outpaced the corresponding 1.2 percent decrease in vehicle miles traveled. According to updated Fatality Analysis Reporting System (FARS) information released Monday, 2011 saw the lowest fatality rate ever recorded, with 1.10 deaths per 100 million vehicle miles traveled, down from 1.11 deaths per 100 million vehicle miles traveled in 2010. • Fatalities increased for the occupants of large trucks (20 percent), pedal cyclists (8.7 percent), pedestrians (3.0 percent), and motorcycle riders (2.1 percent). NHTSA said it is working with the Federal Motor Carrier Safety Administration to gather more detailed information on the large truck occupant crashes to better understand the increase in fatalities in 2011. • The number of people killed in distraction-affected crashes rose to 3,331 in 2011 from 3,267 in 2010, an increase of 1.9 percent. NHTSA believes this increase can be attributed in part to increased awareness and reporting of the phenomenon. “Even as we celebrate the progress we’ve made in recent years, we must remain focused on addressing the safety issues that are continuing to claim more than 30,000 lives each year,” Mr. Strickland said. While experts are quick to admonish that citizens should not make too much of the figures and therefore let down their guard – which is the standard cycle for statistics like these – others are being careful to give credit where credit is due. “The record low fatalities in 2011 are a reflection of the strong progress that's been made in traffic safety,” says Sharon Berlin, a senior research analyst in traffic safety at the American Automobile Association. US Transportation Secretary Ray LaHood expressed similar sentiments, saying seat belt use continues to be an issue. “The latest numbers show how the tireless work of our safety agencies and partners, coupled with significant advances in technology and continued public education, can really make a difference on our roadways,” he said. “As we look to the future, it will be more important than ever to build on this progress by continuing to tackle head-on issues like seat belt use, drunk driving, and driver distraction. (CNN) -- A Massachusetts teen was convicted Wednesday of homicide as a result of texting while driving and will serve one year in prison. In a landmark case for the state, Aaron Deveau, 18, was found guilty on charges of vehicular homicide, texting while driving and negligent operation of a motor vehicle in a 2011 crash that fatally injured Donald Bowley, 55, of Danville, New Hampshire, and seriously injured a passenger in Bowley's car. "I made a mistake," Deveau said Wednesday after his mother told the district court in Haverhill, Massachusetts he would not intentionally hurt anyone. "If I could take it back, I would take it back." Judge Stephen Abany sentenced the teen to two and a half years on the vehicular homicide charge and two years on the texting and causing injury charge. He will serve one year concurrently on both charges and the balance of both charges is suspended for five years. His license will be suspended for 15 years. "There are no winners today," Essex County District Attorney Jonathan Blodgett said in a statement. "A beloved grandfather is dead. A once active woman can no longer work and is still racked with pain from her injuries and a young man is going to jail. When we get behind the wheel of a car, we are obligated to drive with care. ... As we saw in this case, in a split second, many lives are forever changed." In the February 20, 2011, accident, prosecutors said, Deveau's car crossed the center line on a street in Haverhill, which is in northeast Massachusetts near New Hampshire, and hit the vehicle Bowley was driving. Bowley's girlfriend, Luz Roman, 59, was in his car with him and suffered serious injuries. Haverhill Detective Thomas Howell testified the impact left the two "almost folded into the floorboards." Bowley died March 10, 2011, after he was taken off life support. "My brother received such head trauma that ... there was no hope for him," Bowley's sister, Donna Burleigh, said in court. Roman talked about the incident's continued impact. "Loss of sleeping, loss of my boyfriend. So many losses, I can't tell you how many," she told the judge. Essex Assistant District Attorney Ashlee Logan argued that Deveau may have erased some of his texts or lied to police after the accident about when he was texting. Deveau said after the crash in a taped interview with police, which was played in court, "I was tired. I was distracted. When I looked away for one quick second, I came too close to her and I was trying to hit my brakes." His defense lawyer said authorities set out from the beginning to link texting to the crash, a cause-and-effect relationship that he contends is not valid. Some 38 states ban text messaging for all drivers, while 31 prohibit all cell phone use by "novice drivers," according to the Governor's Highway Safety Association. In news that ought to thrill every parent, the death rate of teenage drivers has fallen steadily and dramatically in the United States since 1996, when states began enacting graduated driver licensing laws. Analysis of the death rate was recently performed by the Insurance Institute for Highway Safety and its affiliate organization the Highway Loss Data Institute, which are financed by the insurance industry. According to the research, which was condensed and released in a report Thursday, many deadly crashes involving teenage drivers between 1996 and 2010, the last year for which complete data was available, were attributed to inexperience behind the wheel. Graduated driver-licensing programs introduce driving privileges little by little, with the intention of minimizing potential distractions to new drivers and to shield them from high-risk situations like driving at night and with passengers from their age group. Earlier research performed by both organizations indicated that states with the strongest laws experienced the biggest reductions in fatal crashes among 15-to-17-year-old drivers compared to states with weak laws. The five principal components of these laws are the age at which a teenager can obtain a permit; the number of practice driving hours required; the age at which a teen can test for and receive a license; restrictions on night driving; and limits on the number of teenage passengers allowed in the car. The new analysis was performed to encourage states to improve their graduated licensing laws. There is no national system, so laws vary by state. According to the report, for which findings were based on a sample of 100,000 teenage drivers, the death rate between 1996 and 2010 fell 68 percent for 16-year-old drivers. The downward trend continued for other teenagers, with a decline of 59 percent observed for 17-year-olds, 52 percent for 18-year-olds and 47 percent for 19-year-olds. And for the first time since the I.I.H.S. began keeping records in 1996, the death rate among 16-year-old drivers fell below that of drivers age 30-59. “It’s just a dramatic drop,” Anne McCartt, the senior vice president for research of the I.I.H.S., said in a telephone interview. She qualified, however, that more could be done. There are also preliminary signs that the data from 2010 may indicate the end of the good news. A study conducted by the Governors Highway Safety Association found that the death toll for teenage drivers ages 16 and 17 increased by 11 percent in the first six months of 2011, as reported by wheels in February. Instead of waiting for the National Highway Traffic Safety Administration to release data pertaining to deadly crashes for all of 2011, the association, prompted by reports suggesting there may have been an uptick in deaths involving teenage drivers, surveyed 50 states and Washington for the first six months, according to Jonathan Adkins, a spokesman for the association. N.H.T.S.A. also uses this state-reported data to develop its Fatality Accident Reporting System, or FARS, an annual census of the year’s traffic deaths. “If it is the beginning of a different direction, it’s not clear why that would be,” Ms. McCartt said of the G.H.S.A. study. “We will have to wait until we have the more detailed crash data to take a look. I expect the final numbers will be similar to what the G.H.S.A. has. But I don’t have an explanation for why teen crashes would be up.” Ms. McCartt also noted that rates of fatal crashes can vary from year to year, and an uptick may not be indicative of a greater trend. Regardless of the preliminary 2011 data, the trend from 1996 to 2010 offered ample proof of the efficacy of graduated licensing laws, the organization noted. Even so, the study’s authors said there was still work to do. To that end, the institutes released an online calculator intended to be used by state lawmakers to demonstrate how much they could lower teenage-fatality rates and collision claims if they were to adopt the most strict licensing laws in the country. “We tracked the changes in the fatal crash rates quarter by quarter in all 50 states and looked at how those changes in fatal crash rates related to how the laws were changing,” Ms. McCartt said. The calculator pulls fatal-crash data from the government’s FARS database. 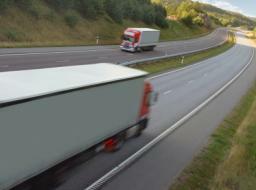 Individual states’ collision claims are sourced from the database maintained by the Highway Loss Data Institute. The institute receives its data from member insurers, who process the great majority of all automobile collision claims, Ms. McCartt said. The institute previously used a rating system to gauge the efficacy of various states’ graduated licensing laws, in which a state’s system would receive a rating ranging from Poor to Good. “But we decided that something like the calculator was a much more effective way to help states figure out what they could do to make the biggest difference,” Ms. McCartt added. South Dakota, for example, allows teenagers to obtain a license three months after their 14th birthday, the youngest licensing age in the nation, according to the institute. If the state were to increase its licensing age to 17, it would experience an estimated 32-percent reduction in fatal crashes among young drivers, the authors claimed. 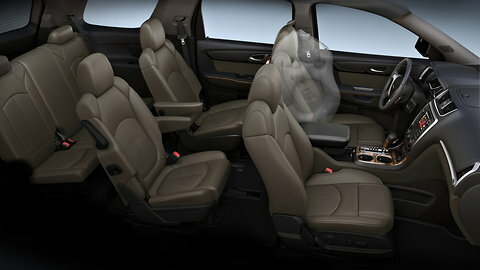 General Motors Simulation of the front-center air bag in the 2013 GMC Acadia. General Motors showed a mildly refreshed GMC Acadia crossover at the Chicago auto show on Wednesday that nevertheless included what G.M. described as a first for the industry. Acadia and Chevrolet Traverse models equipped with power seats will receive a front-center air bag designed to improve protection of front-seat occupants on the far side of the vehicle in a side-impact crash. The air bag will be standard equipment on all Buick Enclave crossovers. The air bag deploys from the right, or inboard, side of the driver’s seat and inflates adjacent to the center console into a position between the front seats. G.M. said the air bag was designed to keep the driver from shifting rapidly toward the passenger’s side of the vehicle. By impeding the lateral movement of the driver, the center air bag can prevent the driver’s head from making contact with the passenger seat or or objects intruding into the vehicle on the far side of the impact. The air bag is also designed to serve as a buffer between the driver and front passenger in driver- and passenger-side impacts, and would deploy in rollovers, G.M. said. “In a side impact it’s very easy for the occupant to slip out of the shoulder belt and then start leaning or tipping across the vehicle head-first,” Scott Thomas, a senior safety engineer for G.M., said in an interview. In such cases, the head or torso can strike any object intruding into the vehicle, the center console, the opposite seat or the other occupant. The front-center air bag was developed over three years by G.M. and Takata, an automotive supplier, Mr. Thomas said. 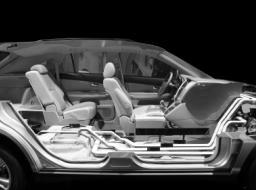 Automakers and safety advocates have primarily focused on increasing occupant safety in near-side crashes, in which the impact occurs on the occupant’s side of the vehicle. These impacts are responsible for more deaths and serious injuries than far-side crashes, according to Adrian Lund, the president of the Insurance Institute for Highway Safety, a nonprofit group financed by the insurance industry. “We have worked on the biggest piece by looking at near-side crashes and how do we protect against them,” Mr. Lund said in a telephone interview. “It is to G.M. and Takata’s credit that they got together and developed this air bag to begin to deal with this situation of far-side impacts, and especially side impacts where you have two occupants in the same seating row. 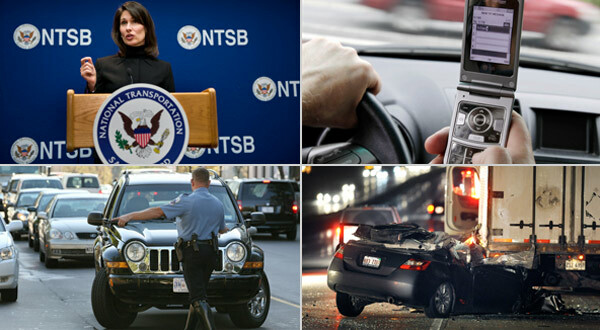 Top left, Deborah Hersman, chairwoman of the National Transportation Safety Board, which on Tuesday urged states to ban drivers from using cellphones. The board's decision was based on a decade of investigations into distraction-related accidents. A federal agency on Tuesday called for a ban on all cellphone use by drivers — the most far-reaching such recommendation to date — saying its decision was based on a decade of investigations into distraction-related accidents, as well as growing concerns that powerful mobile devices are giving drivers even more reasons to look away from the road. As part of its recommendation, the National Transportation Safety Board is urging states to ban drivers from using hands-free devices, including wireless headsets. No state now outlaws such activity, but the board said that drivers faced serious risks from talking on wireless headsets, just as they do by taking a hand off the wheel to hold a phone to their ear. And Deborah Hersman, chairwoman of the N.T.S.B., an independent federal agency responsible for promoting traffic safety and investigating accidents, said the concern was heightened by increasingly powerful phones that people can use to e-mail, watch movies and play games. The agency based its recommendation on evidence from its investigation of numerous crashes in which electronic distraction was a major contributing factor. Ms. Hersman said she understood that this recommendation would be unwelcome in some circles, given the number of drivers who talk and text. But she compared distracted driving to drunken driving and even smoking, which required wholesale cultural shifts to change behavior. The agency’s recommendation is nonbinding, meaning that states are not required to adopt such a ban. And it will likely be frowned upon by state lawmakers makers who are loath to infuriate constituents who have grown accustomed to using their device behind the wheel. But, the recommendation may also provide cover for legislators, safety advocates and others who support such a broad-based ban. Many polls show that while people continue to use their devices behind the wheel, they also widely consider such behavior to be extremely dangerous. The ban is also noteworthy because it is the first call by a federal agency to end the practice completely, rather than the partial ban that some legislators have put in place by allowing hands-free talking. Yet, he also said he doubted it would achieve the desired result because it was unlikely that legislators in California or elsewhere would be able to pass such a ban. Mr. Simitian noted that he spent five years trying to push a ban on hand-held devices, and faced intense opposition from the phone industry. Nine states now ban the use of hand-held phones, and 35 states ban texting by drivers, according to the Governors Highway Safety Association, which represents state traffic agencies. The group’s executive director, Barbara Harsha, called the N.T.S.B. recommendation “courageous” and said it would prompt the group to reconsider its policy, which calls for banning drivers from texting but not talking on the phone. Many mobile phone companies dropped their opposition over the last decade to any restrictions on the use of phones in cars, and have in recent years joined calls to ban texting while driving. In a statement, CTIA, the cellular telephone industry trade group, said it deferred to states about whether to enforce such bans. A complete ban on phone use by drivers would have enormous impact on many car makers that are offering integrated hands-free, voice-activated systems that allow drivers to talk and do other tasks, like calling up their phone directory. The Alliance for Automobile Manufacturers, a trade group for the industry, said in a statement that it was reviewing the N.T.S.B. recommendations. But it also defended the integrated systems, saying they allow drivers to keep their hands on the wheel and eyes on the road while they remain connected. “What we do know is that digital technology has created a connected culture in the United States and it’s forever changed our society: consumers always expect to have access to technology; so managing technology is the solution,” the alliance said in a statement. Ms. Hersman, the chairwoman of the N.T.S.B., said the safety concerns were not just about keeping hands on the wheel and eyes on the road, but also about making sure people focus on the act of driving. The issue is gaining greater internationally, too. Last year, Ban Ki-moon, secretary general of the United Nations, called for an end to the culture of multitasking behind the wheel. Already, 30 countries have some limitations on the use of phones by drivers, including complete bans in Germany and Portugal, said Bella Dinh-Zarr, road safety director of international road safety with the FIA Foundation, a road safety advocacy group. If you are unfortunate enough to land in court after a serious automobile accident, the star witness against you may not be an eyewitness or even a human being. It could be your car. Today’s high-tech automobiles increasingly rely on computers to maximize performance and monitor operating systems. But while the under-the-hood computers are doing that, they may also be recording data about your driving. Typically, that information is collected by a vehicle’s “event data recorder,” or EDR, a computer module that is often compared to the “black box” on a commercial airliner. Among other things, EDRs are capable of recording a number of driver behaviors, including brake application, steering, speed at time of impact in the event of a crash and whether the driver and passengers were using seatbelts. 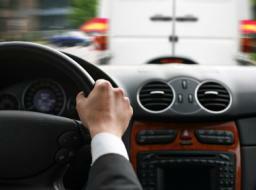 Such information is primarily intended to help improve federal safety standards, but increasingly it is being used in court cases in which vehicles were involved in a serious accident or the commission of a crime. For example, electronic evidence played a key role in a criminal case at the center of Friday night’s “Dateline NBC” (10 p.m. / 9 p.m. Central). The case involves a heartbroken Montana teenager, a dangerous stretch of highway and some ominous text messages. A deadly crash on a notorious stretch of highway forever changes the lives of two Montana families. Dateline NBC's Keith Morrison reports. Among the drivers of that anticipated growth are new National Highway Traffic Safety Administration regulations that take effect next year. The rules do not require EDRs – already in use in more than 85 percent of U.S. vehicles – but they mandate that in cars that have them, the devices must capture and preserve at least 15 types of crash data, including pre-crash speed, engine throttle, changes in forward velocity and airbag deployment times. And one day, the agency noted in its final rule, they may even play a role in getting emergency medical service quickly dispatched to the scene of an accident by automatically sending a 911 alert. Even now, however, such information could be cross-checked with information from devices like cellphones and GPS units to build what could be an air-tight court case. “You want to have the equipment examined to determine the reliability, both from a chronological and content standpoint,” he said. “And there are times when that evidence is of an exculpatory nature, so you want to make sure that you gain access to it – whether it’s a computer or an iPhone or whatever – and that you preserve that evidence immediately.”Drew Findling, an Atlanta attorney and chairman of the National Association of Criminal Defense Lawyers’ Forensic Disciplines Committee, notes that e-evidence might just as easily create an unshakable alibi, which is why he routinely hires experts to examine equipment and data. The increasing use of digital evidence has spawned a new legal specialty – e-discovery – and has added layers of complexity that didn’t exist when cases were won or lost on paper documents. In some cases – particularly those involving corporations – the amount of digital data that must be retrieved and sorted through prior to trial is immense. “State crime labs are adding high-tech pieces, but if you think it’s hard to examine urine and blood samples, try working through a zip drive, a hard drive or an iPhone,” said Findling, the defense attorney. Evidentiary laws also have failed to keep pace with rapidly changing technology, said Rasch. While lawmakers struggle to catch up, judges and courts are taking wildly varying positions on the reliability and admissibility of digital evidence. Gonsowski said much of the variation is attributable to the differing technology comfort levels among judges, prosecutors and defense counsels. Experts have different views of those to-and-fro battles. But that doesn’t account for the fact that programmers create the software that instructs those machines to generate data, Teppler said. The low-cost bus industry, which has revolutionized transportation for students and other budget-conscious travelers, has racked up an alarmingly high number of fatal accidents and safety violations over the last few years, and regulators are having a hard time enforcing federal safety standards, according to a government study released on Monday. The National Transportation Safety Board found that so-called curbside bus companies, which pick up riders on sidewalks rather than in terminals, were involved in fatal accidents at seven times the rate of traditional carriers like Greyhound. Curbside buses, which first gained popularity in the Chinatown districts of Manhattan and Boston by offering frequent rides between major cities for as little as $1 a seat, also were cited for violations related to driver fatigue and training at a higher rate than their conventional cousins. In general, the report found that low-cost bus companies were a safe mode of travel and that accidents happened infrequently. In fact, among bus carriers that operate on regular schedules, the low-cost buses recorded proportionally fewer accidents than their share of the market. The report, the most extensive study of the curbside motor coach industry undertaken by the federal government, was prompted by a bus crash in the Bronx in March that killed 15 passengers returning from a casino trip. Senator Charles E. Schumer, who spoke at a news conference on Monday unveiling the report, described it as “a wake-up call” and asked federal officials to create a more rigorous regulatory system for the industry. In a statement, the Transportation Department, which has oversight of the motor coach industry, said it had nearly doubled its safety inspections on buses in the past five years. It also recently issued rules banning bus drivers from talking on cellphones or sending text messages while driving. But the agency did not dispute the findings that federal regulators can often be stymied by the unique nature of the low-cost bus industry. Because the buses do not park in traditional terminals, officials must make inspections on crowded street corners, which they said could be logistically difficult. Regulators are also barred from inspecting buses in the middle of a scheduled trip, which can reduce the element of surprise. Many drivers and owners of low-cost bus companies do not speak English, and their records are often kept in other languages, which investigators described as frustrating. Officials say they are concerned that the language barrier means some owners do not fully understand every federal regulation. Another challenge is a practice that officials called “reincarnation” — when bus companies with safety violations simply start a new concern under a different name and reuse the vehicles and drivers. That tactic has been used by the company involved in the fatal Bronx crash, World Wide Travel, which is still running its buses through two other companies connected to the owner. Ms. Velázquez, a Democrat whose district includes Chinatown, acknowledged that curbside bus companies contributed to the economic and social activities of her constituents. An article in some editions on Tuesday about the fatality rate in the low-cost bus industry misspelled the surname of a New York State representative, one of the officials who requested a review of the industry. She is Nydia M. Velázquez, not Velasquez. Strong driver's license laws have led to fewer fatal crashes among 16-year-olds but with a disturbing side effect - more fatal accidents among 18-year-olds, a nationwide study found. Many states require young drivers to get extensive experience, including driving with an adult, before getting a full license. But in most states, those laws only apply to those younger than 18. The new study suggests some teens are just putting off getting a license until they turn 18 - meaning they have little experience and higher odds for a deadly crash. "There's an incentive right now to skip out and just wait until you're 18," said Scott Masten, the study's lead author and a researcher with California's Department of Motor Vehicles. "In most states, you don't even need to have driver education or driver training" if you obtain a license at 18, he said. The study examined fatal crashes from 1986 to 2007 involving 16- to 19-year-olds. Results appear in today's Journal of the American Medical Association. The study authors analyzed fatal crash data from the National Highway Traffic Safety Administration and information on each state's licensing programs. Comparing states with the most restrictions versus those with the weakest laws or no restrictions, there were 26 percent fewer fatal crashes involving 16-year-old drivers; but among 18-year-old drivers, there were 12 percent more fatal crashes. Evidence suggests that many teens are waiting until they're older to get their licenses; in California for example, only 13 percent of 16-year-olds have driver's licenses, Masten said. Masten said more research is needed to determine why the fatal crash rate among 18-year-olds rose and whether an increase also occurred in nonfatal crashes. Youngsters who are driven by their grandparents are less likely to suffer from serious injury if they're involved in a crash, says a new study in the journal Pediatrics. Researchers from the University of Pennsylvania, as well as doctors from Children's Hospital of Philadelphia, found even though grandparents are in an older group that has a higher risk of severe crashes, youngsters driven by their grandparents suffered fewer injuries in crashes and were actually safer than children driven by their parents. With more and more baby boomers becoming grandparents, we were concerned about children in crashes with grandparents,” says Dr. Fred Henretig, lead author and an attending physician in the Philadelphia hospital's Department of Emergency Medicine. Investigators, looked at more than four years of crash data ( January 2003- November 2007) to compare restraint-use practices and injuries among children in crashes with grandparents vs. parents. Injury data were collected on 11,859 children under the age of 15. Children driven by grandparents made up 9.5 percent of the sample taken, but resulted in only 6.6 percent of the total injuries. Researchers found that nearly all children were either in car seats or had seat belts on during the crashes. However children in grandparent-driven vehicles were less likely to be restrained correctly. Despite this, little ones in grandparent-driven crashes had half the risk of injuries as those in parent-driven crashes. Editor's note: Dennis W. Hong, an associate professor of engineering at Virginia Tech, leads RoMeLa, a robotics lab at the university that last week won a major worldwide competition in the field -- RoboCup 2011. Blacksburg, Virginia (CNN) -- In our modern society, driving is really a necessity. It is a means of getting you to your destination wherever, whenever. Driving is also fun. Some people even consider it an expression of power. Most importantly, driving is really about freedom, about independence. Sighted people, myself included, do it every day and take it for granted. Unfortunately, because of physical challenges, not everyone has the privilege to drive. My team of researchers wants to find a way to give the blind the ability to drive. When we first announced that we were going to take up this challenge, many thought we were crazy, and most of the critics doubted that it could be done. Even some of my colleagues challenged us on the idea of developing a vehicle for the blind. The car we're developing for the blind uses a sensor to measure acceleration, cameras to detect the lanes of the road, and laser range finders. Drivers are fitted with special gloves with vibrating elements that can be used to control steering and a massage chair that conveys information about the vehicle's speed and about how best to use the gas and brake pedal. I've gotten hundreds of letters, e-mails, and phone calls from people around the world; many times these are to thank and congratulate us, but sometimes we get letters of strong concern and criticism. First, many voiced their concern about the safety of this system. Some of these concerns were because people do not trust the technology, some of them because they do not trust the capability of the blind. No system is failproof. However, this is where true engineering comes in. I would like to ask those who worry about the system failing -- when was the last time you doubted the autopilot that most likely was flying your plane during your last flight? But to reassure those who doubt the safety of the system, I say that the vehicle won't be on the public roads until proven as safe as, or safer than, today's vehicles for the sighted. And I believe this can be done. Regarding the capability of the blind, I believe that with the right nonvisual user interfaces, once we can deliver all the information needed to safely operate the vehicle to the driver, the blind can perform as well as, or possibly even better than the sighted. Mark Riccobono, the first blind driver who drove our vehicle on the Daytona International Speedway, is a better driver than I am -- at least with this vehicle. Second, some worried that even when the technology becomes mature enough and safe enough, the vehicle will be too expensive for people to afford. This is another realistic concern and an important one. We started this project to give freedom and independence to the blind -- and if only a few could afford the vehicle, what good would it be? But we believe that mass production will lower the cost, as with personal computers, mobile phones, and regular automobiles. Still, this vehicle will be more expensive than a regular vehicle, and maybe a government subsidy program would be needed to make it more affordable for the masses. Third, there were some people who questioned whether the type and amount of information being received by the driver from the nonvisual user interfaces we have developed for the vehicle would be sufficient. As Mark mentioned in his speech at the press conference after the first public demo of the vehicle early this year, blind drivers have other sources of information beyond the DriveGrip and SpeedStrip controls. As sighted drivers do, Mark made active use of his other senses such as sound, listening to the noise the tires generate rolling over the roads, and used the sense of angular and linear acceleration perceived from his inner ear to make judgments and adjustments to the controls of the vehicle. As a matter of fact, this project was really not a demonstration of the cutting-edge technology we have developed, but rather a true demonstration of what the blind can achieve with just a little bit of help from technology. If one can believe that we will have fully autonomous, driverless cars in the future, which many people do, then there is absolutely no reason why one should doubt the possibility of a car driven by the blind safely on public roads. Now this is probably the most difficult and controversial question to answer, but it is a valuable argument worth thinking about. If we will have driverless cars in the future, why are we spending time and money developing a car that a blind person can drive? The nonvisual user interfaces we develop can be used for applications other than for driving -- in everyday home appliances, in office settings, in educational settings. The possibilities of spinoff technologies are endless. Also we would like to show the world the true capability of the blind through this project. I want to inspire other scientists and engineers to develop new technology to help the blind. The sensors we use for the blind driver challenge vehicle are almost identical to the ones we use for autonomous vehicles, and we have used for this project many of the technologies we have developed for our autonomous cars for the 2007 DARPA Urban Challenge. But the similarity ends there. The focus of autonomous vehicle research is on developing intelligent vehicles, or artificial intelligence for cars in some sense, while the focus of the blind driver challenge vehicle is developing methods to convey a vast amount of information to the driver through nonvisual means, fast enough and accurately enough for safe driving. For those who think we should only focus our effort in developing technologies for driverless cars, my thought is that even if you ride in an autonomous vehicle, you will want to -- and sometimes have to -- switch to "manual mode" from time to time. This is true for both blind and sighted people. There will be certain situations the computer won't be able to handle, or where the driver will choose to take control just for the fun of driving. I am sure I will buy an autonomous car for our family in the not too distant future. But even though it will be capable of driving me to my destination, I'm also sure I would love to take the wheel and drive it from time to time. Whenever we have new students come to our lab to work on this project, I always ask them this question: "How many times in your life do you really think you will have a chance to change the world?" I believe we are doing just that through this project. As I mentioned in my TED talk, this is just the beginning. Expect to see amazing things and technologies coming soon that will change the world. The opinions expressed in this commentary are solely those of Dennis Hong. "Christopher Gayner, an accident reconstructionist testifying for the defense, argued Riffey's injuries indicate he was hurt by the seat belt on the passenger's side - a point contested in testimony from an emergency room doctor, forensic pathologist and a crash scene reconstructionist with the Colorado State Patrol". Mercedes-Benz is recalling 85,000 of its 2010 and 2011 models because a steering problem could make the vehicles difficult to control. The models are the 2010 C-Class and the 2010-11 E-Class, the automaker told the National Highway Traffic Safety Administration in a recent report. Mercedes said a connection fitting on the high-pressure power steering line might not be tight enough, allowing power-steering fluid to leak. Mercedes said it learned of the problem from customer complaints. Its report to the safety agency did not say whether there had been any accidents. A Mercedes spokesman could not immediately be reached. 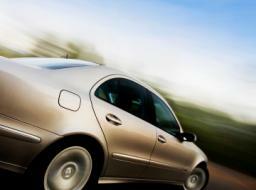 In its report to the safety administration, Mercedes described the recall as voluntary. But once an automaker identifies such a safety defect, the law gives it no option but to recall the vehicle. 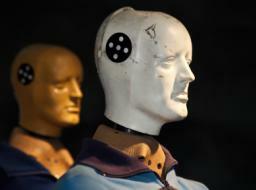 tougher U.S. crash tests for 2011 models out today. New this year: the feds first female dummy, a crash into a pole and an overall score of 1 to 5 stars, in addition to the traditional scores in the individual tests. Just those two of the first 34 vehicles tested the new way earned a 5-star overall score. On the downside: The 2011 Toyota Camry, the best-selling U.S. car, got just 3 stars overall -- after the virtually identical 2010 model got top scores. Toyota took it on the chin -- the hybrid Camry was the only other vehicle to get 3 stars overall. New auto safety legislation is in the works by the U.S. Congress in the aftermath of Toyota’s recent safety dilemmas concerning vehicle sudden acceleration claims. Two new safety regulations on the table address the implementation of brake override systems and standards for event data recorders (also known as black box accident data recorders). Also being debated by Congress is the proposal to increase fines for automakers that fail to report safety defects. Source: Automotive News, May 10,2010. "Legislation regulating transportation safety is saving lives and reducing serious injuries in motor vehicle collisions year after year. In 1966 the U.S. Congress passed the Highway Safety Act, which led to the formation of the National Highway Traffic Safety Administration (NHTSA). The 40th anniversaries of these events recently passed unbeknownst to most people, yet the ongoing societal benefits give cause for reflection and recognition of the thousands of lives saved and .... " (MORE ... Read Entire Article). Accidents happen, but accident reconstruction experts prefer not to call them that. "There were days when everything was called 'accidents,' " said Nashua Police Lt. John Fisher, head of the department's accident reconstruction unit. "In crash investigations, the term is 'crash' or 'collision.' In most of the cases, there is fault of some sort," Fisher said. When a collision is severe and fault is unclear, the case may well wind up in court, where a dozen people will have to sort out who's to blame. Chances are good that jurors will hear from at least two accident reconstruction experts, with two differing explanations of what happened. Having covered two such cases of late, The Telegraph asked various experts and lawyers what such disputes say about the science of accident reconstruction. "Accident reconstruction is a tool, just like a hammer or a firearm or a computer. Like any tool, it can be used wisely and effectively or it can be used improperly and dangerously," said Richard Lehmann, the lawyer who represented a Nashua man accused of killing a pedestrian near the University of New Hampshire in 2004. "It's presented to the jury as science. In a courtroom, it takes good lawyering to be a check on it being used dangerously." Crash reconstruction isn't so much a science as an amalgamation of many different scientific methods and disciplines applied toward the study of motor vehicle collisions. Experts liken the process of accident reconstruction to putting together a jigsaw puzzle with no edge pieces, no box and no photo to show how it should look when it's finished. "Accident reconstruction, as a profession, is a blend of both science and 'art,' " wrote Bruce McNally, of McNally & Associates Accident Reconstruction Services of Rochester. "The science of accident reconstruction is grounded in Newtonian physics, and is generally beyond reproach. "However, the 'art' of accident reconstruction is dependent upon the individual expert's understanding of the laws of physics and his/her interpretation of the physical evidence." Reconstruction experts typically start by diagramming the scene to show the road and all its features, noting weather, lighting and other such conditions. They put each piece of potential evidence in its place, from the vehicles and occupants to any bits of debris scattered by the crash and traces such as tire or impact marks. Then, they work backward to figure out how things got there, experts say. Certain aspects of crash investigations are fairly simple, Fisher said. Experts will seldom disagree greatly on their estimates of a vehicle's speed, for instance; interpreting the marks that tires leave on pavement is so fundamental that it rarely leads to dispute. "Ninety-nine percent of our collisions, I would say there's really no disagreement on how the collision occurred or what the factors were," Fisher said. "More factors in a collision makes for a much more involved investigation and reconstruction." A car that caroms off several objects, for example, will have a far more complex trajectory and set of forces exerted on people and things inside it, experts say. Crashes involving many vehicles are more complicated, and crashes with no clear roadway evidence -- tire marks or other indicators of what caused a loss of control -- can be more puzzling, too. Still, no matter how complex, Strafford County Sheriffs Capt. Joseph DiGregorio said, every accident is simply a series of discrete events involving objects, all of which can be gauged and quantified. "It all boils down to Newtonian physics, when you think about it," said DiGregorio, a certified reconstructionist. (Fisher and DiGregorio worked on fatal crashes that The Telegraph covered, in which they and opposing experts reached different conclusions. Both cases remain before the courts, and Fisher and DiGregorio declined to discuss those cases specifically. Drivers and other eyewitnesses are the least reliable source of information, reconstruction experts agree. "Witness statements are nice, but I don't read them," said one expert, Carl Lakowicz, of Northpoint Collision Consultants in Gilmanton. When people see something unfold quickly and dramatically, their brains tend to trick them into thinking they caught all of the action by filling in any gaps to make sense of what they've seen, Fisher noted. "Humans, by nature, want to make what they don't know turn into a video," Fisher said. "Sometimes, witnesses to car collisions will speak fairly adamantly to something . . . it turns out probably didn't happen." When witnesses' statements match the physical evidence, on the other hand, that can be powerful proof, Fisher said. "We're careful. We look at both," he said. Police investigate all serious collisions, by law, and most accident reconstruction experts are either active-duty or retired police officers, but some also come to the field from engineering backgrounds. Because so many collisions result in insurance claims and lawsuits, there is a great deal of business for experts who can draw authoritative conclusions about who and what caused a crash. Police officers learn basic accident investigation during their training with the state's police academy, Fisher said, and those who work in accident reconstruction units go through additional classes. Police in New Hampshire generally go through courses run by the Institute of Police Technology and Management, which sends instructors to Nashua for its two-week courses. IPTM also offers weeklong courses in areas such as motorcycle crashes and collisions involving pedestrians, Fisher said. There is an organization that accredits and certifies accident reconstruction experts, the Accreditation Commission for Traffic Accident Reconstruction, but the accreditation process takes time, money and no small amount of brainpower, and it isn't in any way mandatory to have such accreditation in order to work in the field. You can get a couple of classes," DiGregorio said, "and dive into the accident reconstruction world." For those reasons, active-duty police are less likely to be certified than those who work in the private sector, experts say. "ACTAR accreditation wasn't a big deal when I got into it," but it has become more so, Fisher said of accident reconstruction. Two officers on the Nashua Police reconstruction team are currently working toward certification, he said. "It does take a lot of study time," Fisher said. "You could be an SAE-certified engineer and not pass the ACTAR test." Applicants can't even take the ACTAR test until they have a fair amount of training and experience. The test includes a written portion, followed by a full day spent diagramming and diagnosing simulated crash scenes, Bartlett said. "I would say that one-day tests like this are the best we've got for distinguishing somebody who has minimal competence versus sub-minimal competence," Bartlett said, adding later, "The ACTAR test is a good effort to separate wheat from chaff." However, while the test can weed out incompetence and single out top performers, Bartlett said, that leaves a lot of room for variety among the masses of reconstruction experts, certified and not. Bartlett said he has seen certified experts reach conclusions he found "inexplicable," and also encountered uncertified experts "who are quite competent." "I think it's important to recognize that egalitarianism is inappropriate here: Not all 'experts' are equal," Bartlett wrote. "Training, experience, understanding of underlying principles and even ethics can come into play, and equal weight should not be given to every opinion by everyone on every topic." DiGregorio, one of the few active-duty law enforcement officers in the state who is also ACTAR certified (Hudson Police Lt. David Bianchi is another), said he believes certification carries some clout. Lawyers who work with such evidence in the courtroom disagree on the importance of an expert's resume. Crash reconstruction is well established and widely accepted as science, despite the lack of mandatory standards and certifications, lawyers said. Judges rarely refuse to accept experienced investigators as experts. "Accreditation in and of itself is not the answer," Manchester attorney Paul McDonough said. "I think that jurors look at the quality of the testimony rather than the letters following the person's name. "It's not unusual to have two experts from opposite sides testify to opposite conclusions based on the same set of facts," McDonough said, and jurors simply have to decide for themselves which is right. "I think jurors have to perform that same function whether it's two experts testifying or two eyewitnesses testifying," he said. Attorney Gordon Rehnborg, of Manchester, agreed that disagreements are common, but added that in his view, "The expert's total credential resume, their CV (curriculum vitae), is very important." it's their job to enforce society's laws, police have to decide relatively early in their investigation whether they have evidence to justify arresting someone or to require a blood sample, Fisher said. If there is evidence of intoxication, however, police can always charge a driver with DWI and continue to review the crash, he noted. Some experts in the private sector suggest police can be swayed by the need to figure things out fast and the human tendency to want to hold someone accountable when something awful happens. "You want to do the right thing . . . and you lose objectivity," said Lakowicz, himself a retired Concord police officer. "We go into it kind of blindly, not having the energy and the anger and the compassion that police officers have when they show up at these terrible accidents." Fisher and DiGregorio dispute the idea that police are inherently biased toward finding fault, although they say all experts agree with the need for objectivity. Police get paid for their time all the same, regardless of whether or whom they arrest, he notes. "There are no bonus points for a yes or no," Fisher said. Although police are responsible for enforcing the laws, he said, "It can't create bias. If it does, you're not doing your job. "We've got to look into everything, and there's just no easy way out of it," Fisher said. "You can't, and we don't, jump to conclusions about these things." Fisher recalls investigating a collision on Lake Street. A woman in the neighborhood had been broadsided by another vehicle, the driver of which was intoxicated, as witnesses at the scene clamored to point out to police. The thing was, Fisher recalls, the woman had run a stop sign. 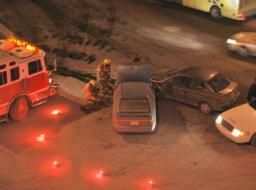 The other driver was charged with DWI, but the crash wasn't his fault, Fisher found. If anything, DiGregorio said, police reconstructionists are biased toward the accused. Once they estimate the probable speed of a vehicle, for instance, the expert will assume a speed at the low end of the range to give a person the benefit of doubt. "As a police investigator, it's up to me to interpret the evidence in the best light for a defendant," DiGregorio said. "No reconstructionist wants to falsely accuse anybody of anything. "\When two experts look at the same crash and disagree on what happened or who caused it, experts say, either there isn't enough evidence for anyone to tell what happened or one of them is wrong. "It is true that an investigator can sometimes read more into the evidence than it can support, or may fail to recognize what it's telling us, but the science is solid when there's relevant evidence," wrote Wade Bartlett of Rochester, a mechanical engineer and ACTAR-certified specialist in motorcycle collisions. "It's up to the investigator to find it, document it and interpret it correctly without bias. "In my experience, if experts from both 'sides' get all the same information, and the information set is sufficient to draw conclusions, the experts agree to a much greater extent than they disagree. Evidence doesn't lie, but there are some cases where there is insufficient information to come to a conclusion that's confidently 'beyond a reasonable doubt' (criminal matters) or even 'more likely than not' (civil matters)." Knowing what can -- and can't -- be known is a big part of the job, McNally wrote. "The limitations of any given reconstruction are based upon how much physical evidence is available in a case, how well that evidence was documented and how well that evidence is interpreted by the expert," McNally wrote. "It is up to the individual expert to understand what the limitations are in a given incident, and not exceed those limitations." Of course, getting one case wrong doesn't mean an expert is incompetent. DiGregorio noted, "You can be the best surgeon in the world and make a wrong diagnosis." In lawsuits and some other types of hearings, judges and jurors decide what happened and who is to blame based on "a preponderance of the evidence," or more likely than not. In criminal cases, cases must be proven "beyond reasonable doubt," so a tie goes to the defendant. "If you have two theories and they are both plausible, there's got to be a not guilty; otherwise, you risk convicting innocent people," Lehmann notes. "There's a very strong impulse to want to hold somebody responsible when something bad happens," Lehmann said. However, he added, "There's such a thing as accidents."